MY family absolutely adores this golden bread filled with cheese and covered with sugar syrup. This is bread that you will find served in many Saudi and other Arab homes. These superb rolls have a slight sweet taste and are filled with cream cheese; we use Kiri then topped with sugar syrup or honey. You can even sprinkle black sesame seeds on the bread before baking for another great flavor. 1. In a small bowl add yeast, 1/2 teaspoon of yeast and water, stir. Allow to sit for 5 minutes until frothy. 2. In a large mixing bowl add flour, sugar, butter, yeast mixture, salt. Add egg and milk a bit at a time until a dough consistency has formed. Form a ball, oil hands and apply all around dough ball not working into. Place into bowl, cover with a towel and place in a warm place for at least an hour. 3. Pre-heat oven to 350F. Meanwhile, ball dough into small balls the size of a large egg. Shape into a bowl and stuff with a heaping teaspoonful of cream cheese. Form back into a ball. Place balls in a greased pie tin touching one another. Cover with a towel and allow to rest for 10 minutes. 4. In a small bowl mix egg white with 1 tablespoon of water. Brush on top of bread. Place bread into oven and cook until golden, 25 minutes. Drizzle sugar syrup or honey on top of bread. A very tasty accompaniment for soups or pasta dishes. All those garlic-lovers out there will find it impossible to resist! Experience our Garlic bread recipe. Step 1: You will need…. Set the temperature of the oven to 175ºC (325ºF/ gas mark 3.5). Spoon the butter into a small bowl. Place some of the garlic cloves into the crusher, squeeze the handle tightly down and scrape off the crushed garlic into the bowl. Continue this process until all the garlic has been crushed. Next, pour in the parsley, season with salt and pepper and stir well. Place the baguette onto the chopping board and cut across diagonally, into 2-3 cm slices, without cutting completely through the bread. Create a gap between the slices, add a dollop of the garlic butter, and smooth it down. Finally spread any remaining butter over the top of the baguette. Unroll the aluminium foil and tear off a large enough piece to wrap the baguette. Place the garlic bread into the centre of the foil and wrap it up making sure that you seal the ends well. Place the baguette into the centre of the oven and cook for ten minutes. Turn it over, cook for a further 10 minutes and remove it from the oven. Once cooked, unwrap the baguette, cut through into slices and serve. 1. In a large mixing bowl dissolve the sugar in the warm water and sprinkle in the dried yeast. Leave to stand in a warm place for about 10 minutes until frothy, add two cups of flour, shortening and salt. 3. Turn out onto floured surface. Knead in enough remaining flour to make a moderately soft dough that is smooth and elastic (3to 5 minutes total). Cover, and let rest in a warm place for about 15 minutes. 5. On well floured surface lightly roll one piece of dough at a time into a 7 inch round, turning dough over once. Do not stretch, puncture or crease dough. Work with enough flour so dough does not stick. Place on baking sheet. Bake 2-3 at a time in 450F about 3 minutes or until dough is puffed and softly set. Turn over with spatula, Bake about 2 minutes more or until dough begins to lightly brown. Repeat with remaining dough, baking one batch before rolling and baking the next batch. 6. Allow bread to just cool before wrapping for storage. Make 12 pita breads. 7. To serve, slice bread in half crosswise and generously fill each pocket with desired filling. • Preparation Time: 20 minutes. • Cooking Time: 20 minutes. 1/2 cup coriander leaves, chopped. 1. Mix all the ingredients and knead well until the dough is very smooth about 5-10 minutes. 2. With oily hands put the dough in a bowl.Cover with a damp cloth or polythene bag and leave in a warm place to rise for about 3 hours or until the dough has doubled in size. 3. Mean while prepared the stuffing. Put the mince and all the ingredients for the stuffing in a bowl and knead the mixture really well for a few minutes with you hands. 3. Knead the dough for another minute or two then divide the dough into 8-10 equal parts. Shape each potion into a smooth ball. 4. Lightly grease several baking sheets. 5. On a floured surface, roll out the ball to about 3 inches in diameter and place it on the palm of you hand. Place good amount of mince mixture in the centre and carefully fold up the edges to completely cove the filling. Press the edges taught together to seal. Dip the stuff ball in dry flour and roll out into a round about 6 - 7 inches in diameter. 6. Brush the nan with a little cold milk and place in a hot oven at 200C (400F) for 10- 15 minutes until the top is golden in color. 7. Remove the nan from the baking sheet and serve at once. • Cooking Time: 40 minutes. Salt to taste (atleast 1tsp). 1. Boil split peas with tumeric, salt and garlic. Do NOT allow to get too soft. Firm but soft enough to flatten with your fingers. 2. Pass through a grinding mill. Make sure there NO whole grains left or these will busrt the roti later. 3. Add zeera and salt to taste. 4. Knead flour with baking powder and a pinch of salt, to a soft dough. Rub oil over dough and leave to rest. About an hour should do. 5. Cut dough in to 6-8 pieces. 6. Shape into balls and leave to rest for 15 mins. 7. Flatten the ball in your hand and place about about 3 tsps of the peas then make into a ball again. 8. Heat the baking stone or griddle to no more than medium heat and brush a little vegetable oil on it. 9. Roll out the dough into 8" circles. 10. Place the roti on the stone and brush with some of the veg. oil. when its starting to brown turn it over and brush again. 11. When the other side is starting to brown it should start to swell. 12. All done. Enjoy with any curry. 13. Try Raita with this dish. • Preparation Time: 15 minutes. • Cooking Time: 15 minutes. 1. Put all dry ingredients in a large bowl and mix well. Make a slight well in the centre and add oil. Using finger tips, mix it into the flour. Add water a little at a time and knead into a soft pliable dough. Knead it thoroughly for several minutes until smooth. Cover with a damp cloth and leave to rest for at least 30 minutes. 2. Divide the dough into 12 equal parts. Roll each into a smooth ball. Then roll each ball into a round of about 6 inches. 3. Heat up a tava, heavy frying pan or a griddle. Test the heat by sprinkling a little dry flour on the surface. The temperature is correct when the flour burns immediately. Wipe the tava with kitchen tissue. 4. Carefully place the round of dough on hot tava. Allow to cook for a minute then turn it over. Smaer a little ghee on the top and then turn it over after a minute. The top side now will have small brown spots. 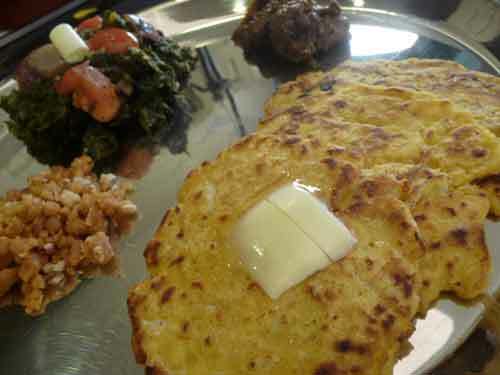 Smear a little ghee on the top and on the surface of tava along the edges of roti. Turn it over again and repeat the process of smearing oil until the both sides are cooked and crisp. 5. Remove from pan, smear with ghee and serve at once. Repeat with remaining dough. 6. Serve with yogurt or Raita. • Preparation Time: 30 minutes. • Cooking Time: 30 minutes. Place 500 grams of strong white bread flour into a large bowl. Add 40 grams of semolina… 2 teaspoons of caster sugar… 1 and a half teaspoons of salt… and 2 and a half tablespoons of olive oil. Then add 10 grams of dried yeast. This is the ingredient which will make the dough rise. Mix well. Gradually stir in 300 millimetres of water. Mix with a wooden spoon until it forms a soft dough. It shouldn't be too sticky, so stop adding the water when it is firm. Sprinkle a little flour onto a work surface and turn the dough out. Use your hands to knead it by pushing away with the palms of your hands, and pulling it back with your fingers, turning it frequently. Keep kneading for about 10 minutes. The dough will become soft and silky to touch. Form a compact ball. Lightly oil a large bowl- this will prevent the dough from sticking to the sides. Put the dough in and cover either with cling film or a clean cloth. Put the bowl in a warm place and leave it to rise for about 45 minutes, or until it has puffed up and feels soft and springy to touch. While the dough is rising you can prepare the sauce. Put 2 tablespoons of olive oil, 1 400g tin of tomatoes, 1 teaspoon of herbs, a good twist of black pepper, and 2 pinches of salt into a saucepan. Place on the hob, and turn on to a medium to low heat. Give it a quick stir. Leave it to thicken for about 20 minutes, stirring occasionally to ensure it doesn't burn. Then take it off the heat, and leave to cool until it's needed. Lightly flour a surface and roll the dough into a long sausage shape. Then slice off small fist sized pieces. Shape each piece into a disc, then roll out into a small circle. When risen, bring the pizza bases back to the work surface. Spoon a little of sauce onto each pizza base, and spread it out. Now it's time to get creative with your toppings, try the following; Slice the mozzarella and arrange on the pizzas. Split the anchovies in 2 and lay in a cross. If your olives have stones, remove them, cut in two and place them on the pizza. Sprinkle over a few pinches of herbs. Arrange a few caper berries or capers. Whatever you like! Put the pizzas in a warm dry place and leave to prove again for about 10 minutes. Then, transfer to the oven to bake for 20 minutes, or until the bases are evenly cooked and golden, and the cheese has melted. 1. In a large bowl, mix the flour and salt well. 2. Add oil and mix again to incorporate the oil into the flour. 3. Slowly add warm water and knead to form a dough. 4. Shape dough into a ball and rub a few drops of oil on it to coat. 5. Cover and let it stand for at least 15 minutes. 6. Knead dough once more and divide it into 9 ping pong size balls. 7. Roll each ball in your palms and press into a flat circle. 8. Put ½ cup of whole wheat flour in a flat bowl or dish. 9. Dip a flattened ball into the dry flour and coat it on all sides. 10. Using a rolling pin, roll out each ball into a flat disc – similar to a tortilla. 11. Keep dipping the dough into the dry flour while rolling so it doesn’t stick. 12. Heat a tava or skillet on medium heat. 13. Place the rolled chapatti on the skillet. 14. When bubbles start to form, flip the chapatti over. 15. After about 10-15 seconds, smear the chapatti with a little oil and flip over. 16. With a spatula, press the chapatti to make it balloon up. 17. Smear the other side with a little oil and flip over again. 18. Keep pressing on the bubbles gently to make the entire chapatti rise up. 19. Chapatti is done when all the raw dough appears cooked. 1. Practice, practice, practice! The more you make chapattis, the better you will be at rolling them. 2. While rolling a chapatti, gently rub your palm over it. You can immediately feel where it is too thick or too thin. Then, roll accordingly. The goal is to have a chapatti that is the same thickness all around. 3. Invest in an insulated chapatti container. As you cook the chapattis, place them in the container and close the lid to keep them piping hot until dinner time. 1. Prepare dough according to Paratha/Chapatti recipe/video from ShowMeTheCurry.com and keep aside. 2. Mash or grate boiled Potatoes. Grating prevents lumps. 3. In a medium sized bowl, add Potatoes with remaining filling ingredients and mix well. 4. Keep a tava or skillet on the stove at medium to medium high. 5. Divide dough into equal size balls (approximately 8). 6. Divide Filling into equal size balls (approximately 8). 7. Roll out one dough ball into a 3-4 ” disk. 8. Place a Filling ball on the center of the disk and fold the dough around the Filling ball, completely enclosing it. Pinch the dough ends together. 9. Flatten the stuffed ball and dip it into the dry flour on both sides. 10. Using a rolling pin, roll out the stuffed ball into a tortilla shaped disk. The paratha should not be too thin. 11. Place the rolled paratha on the heated skillet and cook until bubbles start to appear. 12. Start to roll the next paratha while one is cooking to get a process in place. This is a great time saver. 13. Once bubbles appear, flip the paratha over and lightly spray it with cooking oil. 14. Allow this side to cook for 30 seconds and flip it over once more. Again, lightly spray with cooking oil. 15. Keep flipping and cooking the paratha until the look of raw dough is gone and it looks completely cooked. It should have light golden/brown spots. 16. Keep the paratha in a covered or insulated container and repeat process for remaining parathas. 1. Health tip — When rolling the paratha, we try to use minimal dry flour to prevent too much oil from soaking into the paratha. 2. There can be many different stuffings for parathas. 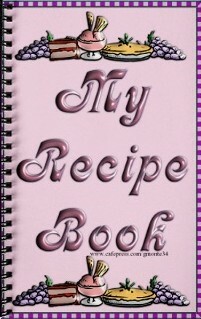 Be creative and look out for more recipes coming soon. 3. Parathas and Chapattis freeze well. Just cook them without oil and freeze (placing wax paper in between each paratha). When ready to use, defrost and re-heat the paratha using oil to freshen up the taste. 1. Mix the Flour, Salt and Oil together. 2. Mix well to incorporate all the Oil into the Flour. 3. Add a little Warm Water at a time to form a dough. 4. Option- A food-processor can also be used to make the dough. 5. Once the dough is made, smear a couple of drops of remaining Oil coat it. Oil will help avoid forming a crust. 6. Cover and allow the dough to rest for about half hour or at least 10 minutes. 7. After the rest time, knead the dough once again. 8. Heat Oil for frying the Puris on Low-to-medium heat. Allow it to heat very well. 9. Make balls of the dough (approx table-tennis size balls). Makes 12-15. 10. Take one ball and roll it into a nice, smooth round ball with the palm of your hands. 11. Then press it flat. 12. Roll it out with a rolling pin to form a nice even round discs without using flour. 13. The puris are usually smaller than chapattis and a little thicker (so they can puff up). 14. Once the Oil is nice and hot, gently slide the Puris in from the side. 15. The Puri will settle at the bottom for a few seconds before it come up to float. 16. Once it starts floating, gently press on one side with a frying ladle. This will help the Puri to puff up. 17. After a minute or so, flip the Puri and cook on the other side. 18. After another minute, scoop the puri to the side and drain out all the excess oil. 19. Put the done Puri on a paper towel. 20. Serve hot and fresh with Dahiwale Aloo, Chole or Suji ka Halwa. 1. A pinch of Carom Seeds (Ajwain) may be used in the dough. It helps to digest. 2. 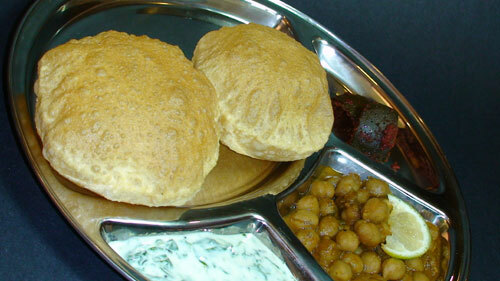 As a variation, add a boiled and mashed potato to the dough to make ‘kasta puri’. 3. Test the oil by putting in a small ball of dough to see if the oil is ready. The little ball of dough should go to the bottom and then after a few seconds float to the top of the oil. The oil is then ready. 1. In a medium bowl, add Flour and Oil and mix until oil is well incorporated into the flour. Keep aside. 2. In a blender, add remaining ingredients except Oil for cooking and additional water. Grind to a smooth paste. 3. Add Spinach mixture to Flour and form a medium firm dough. It may be necessary to add a little additional water. 4. Form dough into a ball and rub a few drops of oil on it to prevent drying. 5. Cover and keep for 15-20 minutes. 6. Heat Tava or skillet on medium heat. 7. Knead dough once and divide into golf ball size portions. 8. Roll one portion into a smooth ball and flatten it out into your palms. 9. Dip into dry flour to prevent it from sticking to surface while rolling. 10. Roll dough out into a 5-6 inch disc. 11. Smear oil onto half of the disc and sprinkle a pinch of dry flour onto it. 12. Fold disc into a semi-circle. 13. Smear oil onto 1/2 of the semi-circle and sprinkle dry flour onto it. 14. Fold semi-circle into half to form a triangle. Dip into dry flour once more. 15. Roll triangle out into paratha. You can choose to keep the triangle shape or roll it into a round shape. 16. Place paratha onto your skillet or tava. Wait until bubbles appear before flipping it over. 17. Wait another 20-30 seconds, lightly smear oil onto the top and flip over. 18. Press gently with a spatula to make the paratha balloon up. 19. Lightly smear oil on this side and flip again. Press again to cook paratha until all uncooked areas look cooked. 20. Place cooked paratha in an insulated container and repeat process for remaining parathas. 21. Serve hot with subzi, curry, yogurt, pickle or butter. 1. In a medium bowl, mix together Flour and Salt. 2. Add Warm Water slowly and knead to form a medium firm dough. 3. Let the dough rest for 15 minutes, covered. 4. Divide the dough into golf ball size balls. 5. Dip the dough ball into dry flour and roll it out into an oval shape (approx 5 inches). 6. Tandoori Rotis are a little smaller and thicker than normal chapatis. 7. Place rolled out roti on a hot tava and cook until bubbles appear. 8. 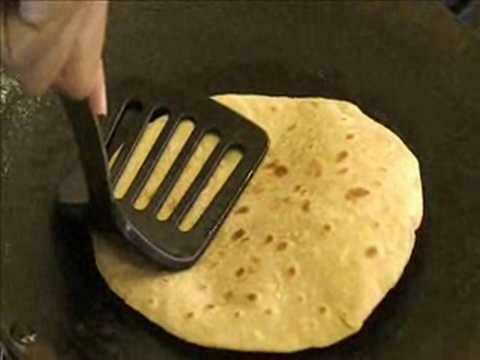 Flip the roti over and cook this side until light brown spots appear. 9. Remove roti from tava and keep in a covered (preferably insulated) container. 10. Repeat the process until all rotis are cooked on tava. 11. 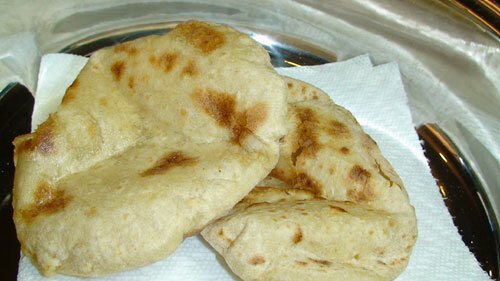 When ready to eat, pop rotis into a toaster and toast them on medium until they puff up. 12. You may need to re-toast the roti until darker brown spots appear. 13. Once the roti is done, remove from toaster and lightly butter it. 14. Place the roti in a paper towel and lightly crush it. 1. Depending on the bread you have, melt the required amount of Butter in a skillet. 2. Once melted, add in minced Garlic and Green Chillies. 3. Once mixed in add Salt (if you are using Unsalted Butter) and a pinch of dried Oregano. 4. Once the Garlic is cooked and has got a little color, take it off the flame. 5. Slice your bread to desired thickness and brush some of the mixture on it on one side. 6. Toast either in an Oven (350 degrees F until golden, approx 5-6 mins) or a Taster Oven till it is a little browned at the edges. 7. Serve hot with Pasta or Lasagna. 2. Add in the Muli with squeezing out the liquid. 4. Add in hot Water, 1 tbsp at a time. 5. Knead so you are able to make a ball. 6. Take a plastic bag/ziploc and cut it open. 7. Place it on your rolling surface. 8. Wet the surface with water. 9. Place the peda/ball and add a few more drops of water on top. 11. Take a flat bottomed plate and press down gently. 12. Press gently and firmly and evenly. 13. Carefully remove from the plastic and place on a hot, seasoned tawa. 14. Allow it to cook on the bottom. 15. After a couple of minutes, put a few drops of ghee on top and flip. 16. Cook the other side as well and take it off the flame and serve hot! 17. 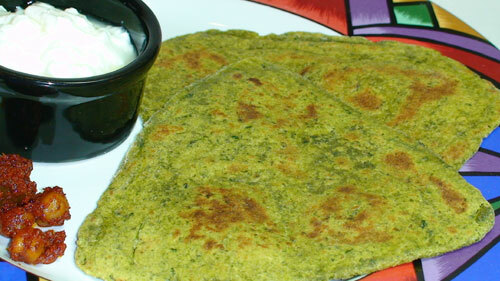 Serve with Sarson Da Saag, Gur Accompaniment, some Maa Di Daal!